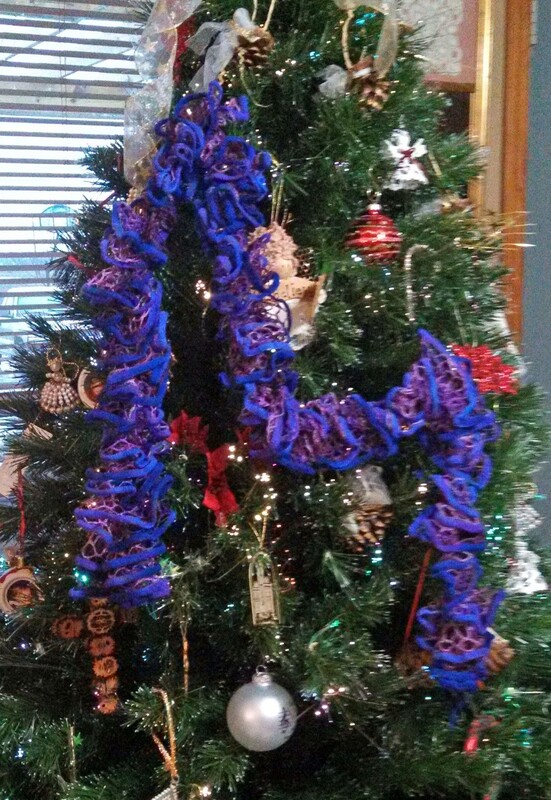 My very first knitting project was a knitted scarf made from Lion Homespun and two cheap plastic stick needles. I don’t know what happened to that scarf. I think I have the needles, somewhere. The pattern is very easy and yields terrific results. The yarn is very nice and lofty, and this becomes my go-to gift scarf (particularly to men) because it is so well-received. Don’t tell them that it is also the easiest and quickest pattern to knit! Instructions: This project is worked with two strands held together and knit at the same time – pull from the center and the outside of the skein at the same time. Cast on 12 stitches using the long-tail cast on. Knit until you are nearly out of yarn. Cast off using stretchy cast off method (I use the knit 1, YO backwards, k1, pull YO over last stitch, pull first stitch over last stitch). I was out of my usual stash of ready-to-give scarves, so picked up three skeins at Michael’s on a recent trip to the city. This project only takes a few hours – I knit up the three you see here over the weekend. One year, I gave this scarf to everyone in my family. One thing I noticed was that every scarf was a different length. This is true for this set, also. New project, “new” yarn, but it’s been in my stash for years; I don’t remember where I purchased it. Yarn is Moonshine Chrystal Palace Yarn in color Deep Seas (511). I think this particular type of yarn has been discontinued, but the manufacturer has other, similar yarn. The yarn is variegated, with silver metallic threads running through the ply. Pattern is Gris de Lin, by Cailliau Berangere, and available for free on Ravelry, through the link. As sometimes happens, I started and unraveled this project a few times. Eventually, I used a larger needle than in the pattern, and enlarged the repeats by 2-3 additional repeats so that the finished cowl would drape a little more. Once I got onto the pattern, it was easy to memorize, and fun and fast to work up. I used up every bit of the yarn, and had to add a little neutral yarn to complete the bind off. Another pattern from Creative Knitting – this time, the September 2012 edition. 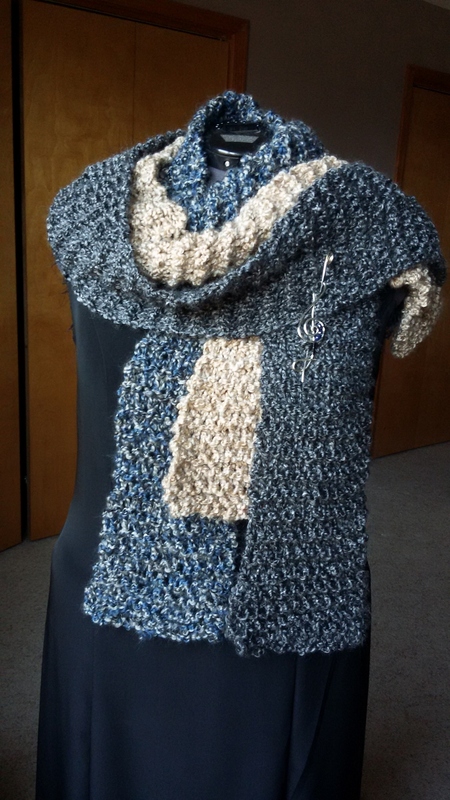 Grey Matter Cowl, by Sandy Prosser, as part of a Grey Matter cardigan project. 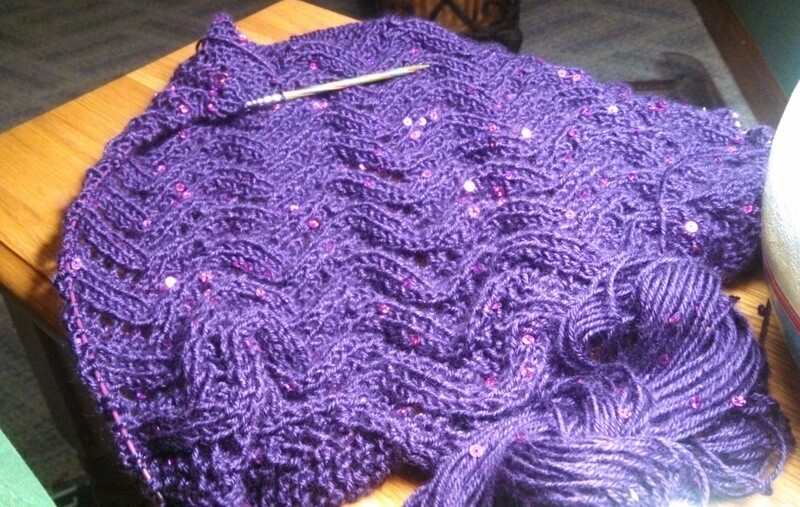 Yarn is a nice acrylic blend with sequins that I picked up at River Knits. Unfortunately, I’ve misplaced the yarn band, so I can’t give you more details than that. I only bought the one skein to try. Hopefully, I’ll find the yarn band and can update this information. I really like the yarn, however, so I will probably go back to pick up more for another project. Light, drapey, and soft, this is pretty easy to knit, but difficult to TINK, because the sequins tend to get caught in the yarn. Despite the fact that the yarn was the yardage called for in the pattern, and I actually was knitting to gauge, this is not working up as expected and as modeled (unless I’m missing something, which is entirely possible). For a cowl, it seems to be too wide, and as I neared the end of the skein, I was nowhere near the 31 1/2 inches called for in the pattern. 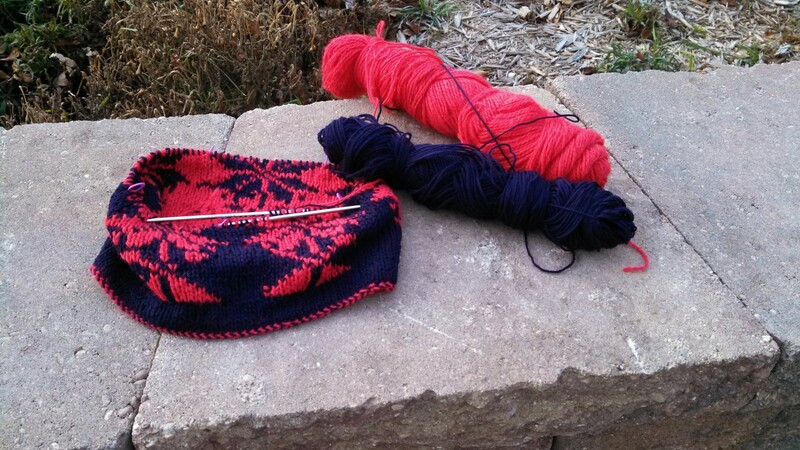 I took this picture a few days ago, and have since ripped back to the beginning, and am starting over – this time with fewer pattern repeats, which should make it narrower and much longer. Provisional cast-on. I don’t use a Provisional Cast-On very often, and I find it awkward, and usually have to do it more than once. This time was no exception. Pattern repeats. This is a simple pattern, easy to memorize, but I mess up the counting as often as not. Very frustrating. By the time this picture was taken, I had somewhat gotten the hang of it, but now that I’m starting over, I seem to have lost my grip on the rhythm. Probably the last one of these I’ll knit. Too fussy for my level of patience. This is Yarn Bee Chrysalis – not sure of the color (112? – whatever that is – I lost track of the yarn band). I was not happy with this yarn – it “grabbed” too much – I foresee much getting-caught-on-things its future (apologies to the person it was knit for – you’re gonna get it, anyway). I thought it was just me – my hands can be on the dry side in the winter – but when I took the picture on the tree, it was a terrible mess to get OFF! 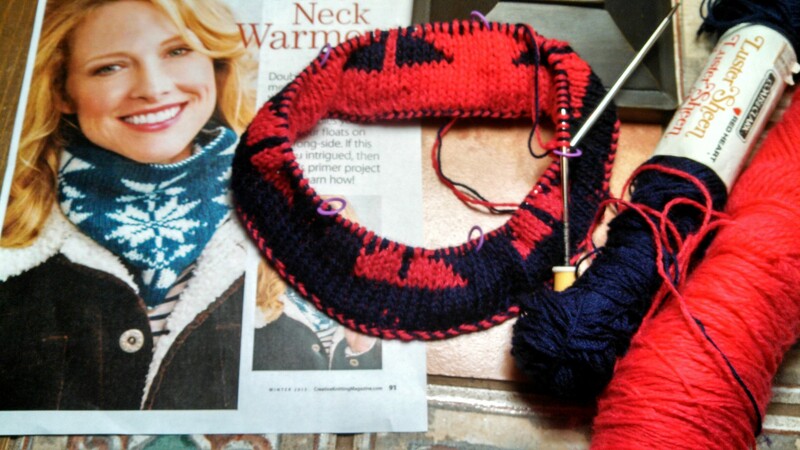 Like before, this is a simple knit scarf – 6 stitches on the needle, knit until done and bind off. There are some videos to guide you I’ve posted one before, and here’s the link, if you would like to watch: How to Knit a Ruffled Scarf. 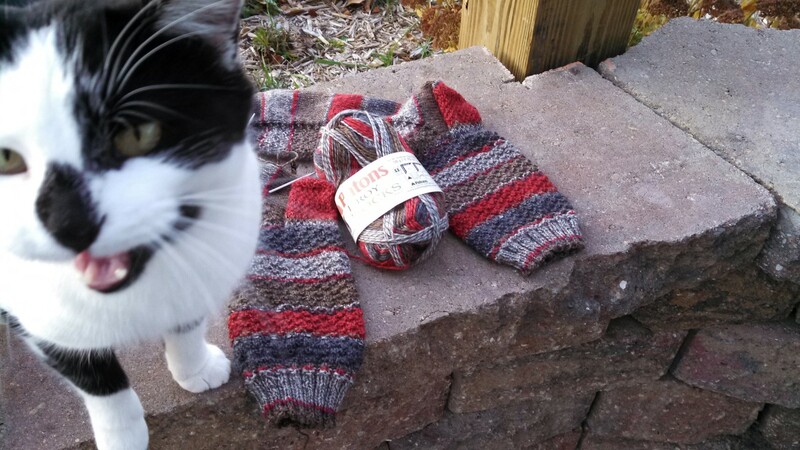 Hermione’s Every Day Socks – I’m loving this pattern and yarn combination. Note that I’ve modified the pattern slightly for a more “pebble” texture. 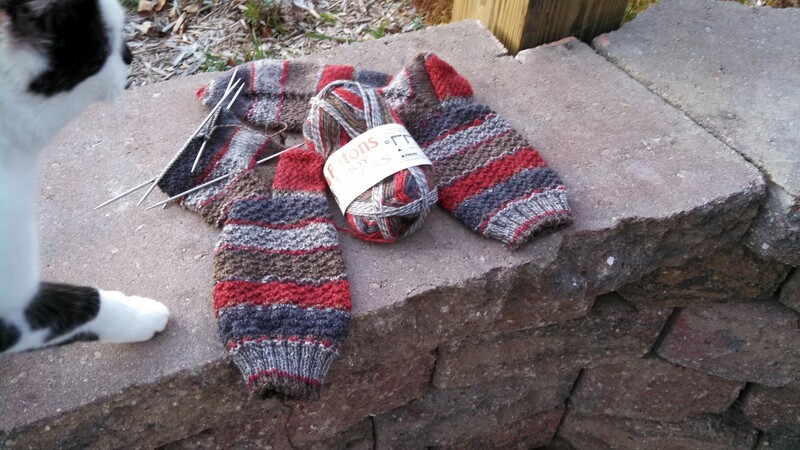 The Patton Kroy Sock Yarn in Grey Brown complements that pattern very well. Definitely going to be a “guy” gift – I think I have made it plenty large enough for a man’s foot. You can see the texture very well in the morning light. Note that I’ve managed to match the stripes – not something I can always accomplish. Photo bomb courtesy of Chess. She’s a sweet female we adopted this summer when her family moved away and left her behind (they took her kittens, though – she was doubly-bereft). She’s a terrific hunter – over three consecutive mornings this summer I watched her catch two mice and an unidentified small rodent that might have been a baby bunny. She’s also a nice lap kitty when I’m reading on the patio. She’ll sit quietly on my lap and let me read in peace. I took this picture this morning after I fed her, so she’s being all grateful and wanting pets.